If you are looking to accelerate your dreams and goals but struggle with limited funds, a lack of knowledge, connections or resources, I know exactly how you feel. After losing my dream job, I became broke and did not know where or how to start. I had to find a way to rise above my struggles. Becoming an entrepreneur and learning how to start and grow profitable businesses helped me multiply my income and rise again. I believe this can be your story too - with a little help from The Jokotade 7-Figure School. If you've been wondering what business ideas to consider or start, this class is for you. In this online, video training replay, you'll receive over 3 hours of hands-on instructional training to save you time, money and pain. Pay in U.S. Dollars or in the Nigerian Naira or simply checkout with PayPal. After payment, you'll receive an email with details to access your class. What has helped me stay in business for almost 2 decades and how you can replicate my success. I help dreamers start and I help starters grow. Let me help you rise above your challenges. Choose your class now! Review the options available and choose the class that best fits your needs. Save money and time when you register for multiple classes. Complete your payment online with a card or pay with PayPal. Can't pay in U.S Dollars? 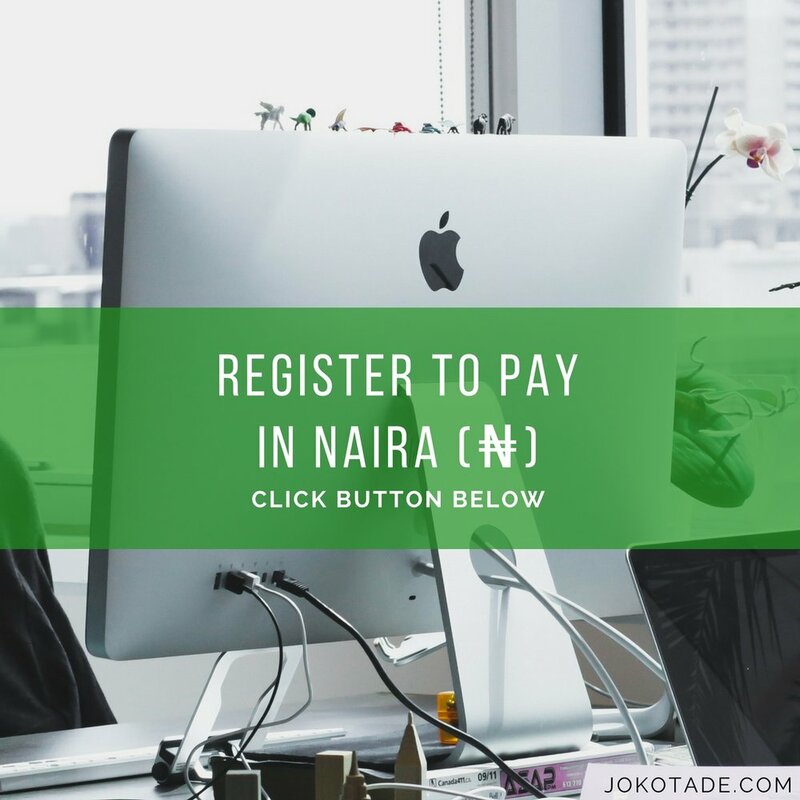 Register to pay in Naira and secure your spot. Receive an email with access details to login to your online class. Watch your online class and start making progress. "As a BSc holder of Computer Science with an Aptech certified proficiency in Information Technology, and loads of other online trainings bagged, I finally kicked off my other life passion...I got spurred up to do this after attending the @jokotadeshow Masterclass on Multiple Streams of Income. She made us realize that our potentials and gifting should be used to add value to others." "Amazing class. This is a 5-star for me." Thank you for registering for school. 2. Confirm your payment with Dolapo when you call 07019586027. 3. Step 2 confirms and secures your registration. You'll receive an email with class details after your payment is received and when registration closes. You want a hands-on, leave-out-the-fluff, down-to-earth trainer that will keep concepts simple and help you take immediate action for effective results. The course was very thorough! Many thanks! It was worth my time and I was inspired by your journey to success ...Very helpful practical responses...you're amazing! I am a Nigerian-American author, speaker and a full-time serial entrepreneur - for over 13 years. My audio and video programs equip listeners and viewers in over 100 countries. I break down complex issues and I keep things simple. I share my own experiences so you know exactly what you need to do.